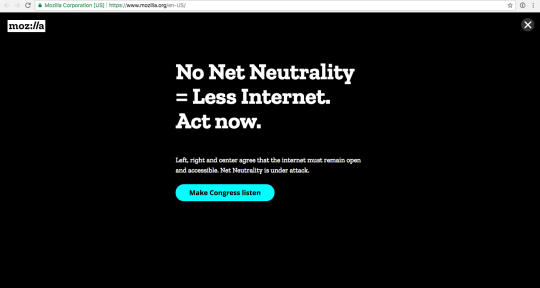 The unprecedented public backlash to the FCC’s plan to slash Title II net neutrality protections continues to grow. 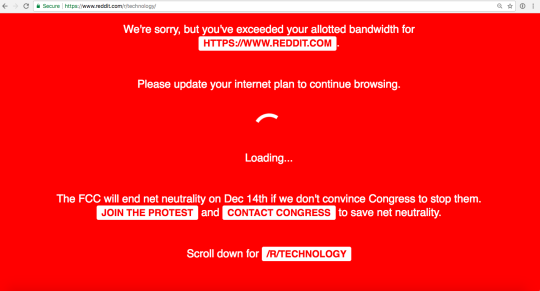 After thousands of people took to the streets to protest last week, Internet users, websites, apps, and online forums are participating in “Break the Internet,” a mass online protest for the 48 hours before the FCC vote. The protest is demanding that Congress take action to stop the FCC or overturn their repeal. Just today, the first Republican lawmaker publicly called on the FCC to stop the vote. See screenshots of how various sites and Internet users are participating here. The protest is taking many forms on social media, apps, and websites across the Internet. 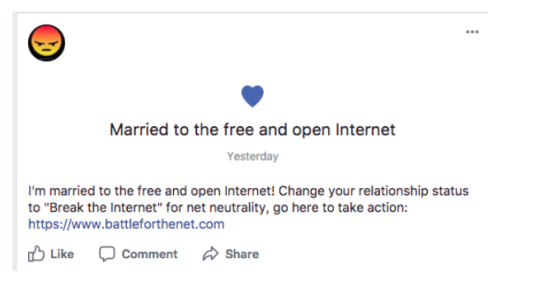 Facebook and LinkedIn users will “break” their profiles by changing their relationship status to “Married” (to net neutrality) or adding a new “job” of “Defending Net Neutrality.” Websites and apps will participate by doing something to “break” their platform and encourage their users to contact Congress. 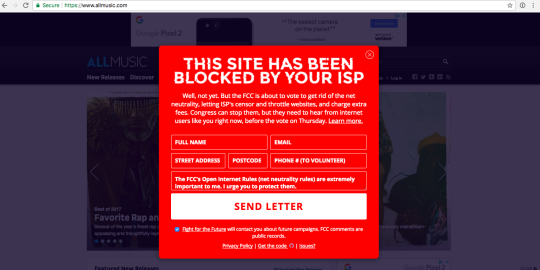 Sites helping sound the alarm include Imgur, Tumblr, Mozilla, Pinterest, Kickstarter, Reddit, GitHub, Etsy, BitTorrent, Pornhub, Patreon, Funny Or Die, Speedtest, Fiverr, Cloudlfare, Opera, Trello, the Happy Wheels game, DeviantArt, AnimeNewsNetwork, and BoingBoing.